Texas often is called the Lone Star State because of its state flag with a single star. This was also the flag of the Republic of Texas. 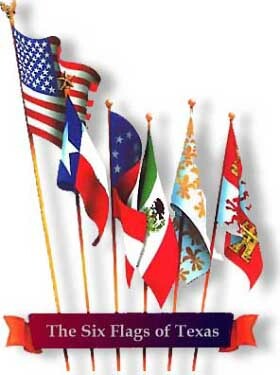 The following information about historic Texas flags, the current flag, decommissioning the Texas Flag and other Texas symbols may be supplemented by information available from the Texas State Library, Austin. United States - 1865 to the present. At the convention of 1836, at Washington-on-the-Brazos, Lorenzo de Zavala is reported to have designed a flag for the Republic - a blue field with a white star of five points central, with the letters T E X A S between the star points. Probably because of the hasty dispersion of the convention and loss of part of the convention notes, nothing further was done with the De Zavala recommendation. The first official flag of the Republic, known as David G. Burnet's flag, was adopted on Dec 10, 1836, as the national standard, "the conformation of which shall be an azure ground with a large golden star central." A new national standard was worked out and approved by Mirabeau B. Lamar and was adopted by Third Congress of the Republic on January 25, 1839. This flag consisted of a blue perpendicular stripe of the width of one-third of the whole length of the flag with a white star of five points in the center thereof, and two horizontal stripes of equal breadth, the upper stripe white, the lower red, of the length of two-thirds of the whole flag. This is the Lone Star Flag, which later became the state flag. It is generally accepted that the Texas flag's colors represent the same virtues as they do in the United States flag: Red means courage; white, purity and liberty; and blue, loyalty. Although generally used, the state flag was not officially described and usage rules adopted until 1933. These rules are from HB 1463, 73rd Legislature (1933). Flown out-of-doors, the Texas flag should not be displayed earlier than sunrise nor later than sunset unless properly illuminated. It should not be left out in inclement weather unless a weatherproof flag is used. It should be flown with the white stripe uppermost except in case of distress. When the flag is displayed against a wall, the blue field should be at the flag's own right (observer's left). The Texas flag should be displayed on all state memorial days; it should fly at every school on every regular school day. The Texas flag should be on the marching left in a procession in which the flag of the United States is carried; it's staff should be behind the staff of the flag of the United States when the two are displayed with crossed staffs. The Texas flag should be underneath the national flag when the two are flown from the same halyard. When flown from seperate, adjacent flagpoles, the United States flag and the Texas flag should be of approximately the same size and on flagpoles of equal length, and the United States flag should be on the flag's own right, that is to the observer's left. The Texas flag should never be used for any utilitarian or strictly decorative purpose. No advertising should be placed upon the flag or flagstaff, and no picture of the flag should be used in an advertisement. When the Texas flag is in such condition that it is no longer a suitable emblem for display, it should be destroyed, preferably by burning. More information on the use of the state flag can be found in Title 106, Revised Statutes, Article 6139c, "Texas Flag Code." An act of the 71st Legislature in 1989 further stipulated that a person reciting the pledge to the Texas flag shall: (1) face the flag and place the right hand over the heart; (2) remove any hat worn by the person; and (3) recite the pledge with pride and patriotism. The pledge to the Texas flag may be recited at all public and private meetings at which the pledge of allegiance to the United States flag is recited and at historical Texas events and celebrations. The pledge to the Texas flag shall be recited after the pledge of allegiance to the United States flag if both are recited.